The nation of St Vincent and the Grenadines is comprised of eight inhabited islands and about two dozen other islands and cays. These islands are at the lower end of the Lesser Antilles and the Windward Islands. Scattered across the populated islands are guesthouses, hotels, and all-inclusive resorts, some with their own islands. Other remote and untouched islands in this area have retained their natural beauty, and remain private spots accessible by boat. This area has some of the best yachting in the Caribbean. A vacation to his mother's home country of St. Vincent and the Grenadines led to Scott's becoming the national-team coach. Philadelphia Inquirer. Wednesday, 11 Jul 2018 21:31:37 GMT. Early residents on these islands were the Carib and Arawak Indians. At one point, these Indians rescued some shipwrecked slaves and intermarriage produced Black Caribs. The British came in 1722 and established sugar plantations. Many of the plantations were later destroyed by a hurricane, as well as by a volcanic eruption. As a result of these types of disasters, St Vincent and the Grenadines have taken longer to develop their tourist trade. St Vincent, the largest populated island in the group, features a rain forest, cultivated valleys, and an active volcano. Kingstown is the capital city of St Vincent and the Grenadines, and its tourist attractions include a cruise ship terminal as well as the Botanic Gardens, which were established in 1765. Outside Kingston, the Montreal Estate Gardens grow in the Mesopotamia region, and Hadley Blooms, an anthurium nursery, produces beautiful flowers. Saint Vincent also hosts a volcano, La Soufrière, and a waterfall, the Falls of Baleine. For a day trip, consider a cruise aboard the Friendship Rose, a traditional, hand-built Caribbean schooner. 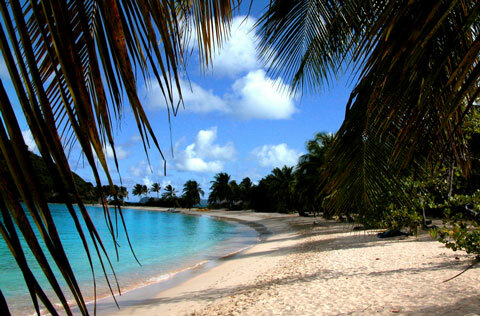 The Grenadines offer small hotels, simple food, and secluded, white sand beaches. The coves around these islands are among the finest snorkeling locales on Earth. Some of the Grenadine islands have airstrips that service a cluster of smaller islands. Boatbuilders and fishermen are common sights, and most communities on these islands are linked by boat service. Just an hour south of Kingston by ferry, Bequia has plenty of unique opportunities for tourists. Shops, restaurants, Spring on Bequia (a hotel, working studio, and art gallery), the Old Hegg Turtle Sanctuary, and a whaling museum are among the attractions vying for your time. The "island of turtles" is a great place to study sea turtles in June. This island is part of Grenada. Mayreau's beaches at Saltwhistle Bay are popular to windsurfers and kiteboarders. Rent a private villa on this popular celebrity hideaway, and enjoy the secluded setting and numerous white sand beaches. A miniscule island with a private resort. For a private and luxurious vacation, rent a cottage on Petit St. Vincent. These uninhabited bits of land attract snorkelers, divers, and sailors. Visit Mount Parnassus or head on to Tobago Cays from Union Island. A tiny tropical island with a resort.